This Pesto White Bean Hummus is ridiculously creamy and addictive with notes of fresh pesto and hummus flavors. 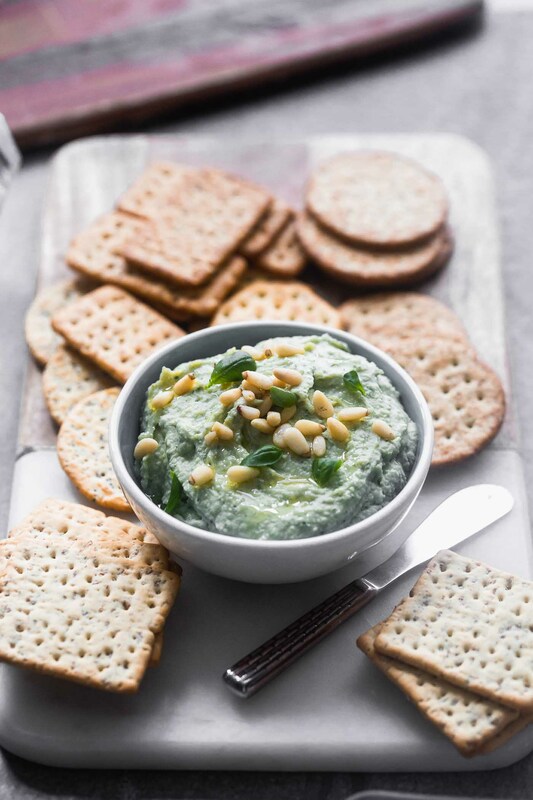 Perfect with crackers, pita chips or crudités! A few weeks ago when I made this Easy Basil Pesto, I was unabashedly bragging about how my basil plant was thriving. I’d managed to keep it alive for a solid two months, and on top of that, I’d even trimmed it well enough for it to grow OUT, not up – a feat in of itself. Welp, my pride has come to an abrupt halt, because as I moseyed on over to my basil plant to trim the leaves for this Pesto White Bean Hummus, I was faced with the harsh reality that my basil plant had shriveled down to basically nothing while we were out of town last week, despite diligent watering by my brother. I think the heat and lack of trimming got the best of it, unfortunately. So that left me with a predicament, because those of you who have kiddos at home with you know, it isn’t for the faint-hearted to throw the kids in the car, buckle their impossibly difficult car seats up, and head to the grocery store for one measly bunch of basil. Buuut because I had dreamy thoughts of a hummus-meets-basil white bean dip I couldn’t stray away from, I took one for the team, packed the kiddos up, and prayed I wouldn’t regret my decision. 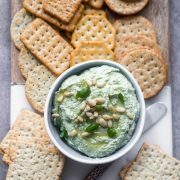 While this dip is simple in its ingredient list and preparation, the end result is exactly as I’d imagined – a totally addictive, ridiculously creamy dip with pesto-like flavors in each bite. What’s even more alluring, is you can literally throw everything in the food processor (it’s really a must for this recipe, and this one is my favorite! ), turn it on, and sit back and relax while it comes together. The hardest part is showing enough restraint to keep yourself from taste testing until it’s all gone. As aforementioned this has a pesto-meets-hummus taste, but instead of using chickpeas, which I can get kind of tired of, I swapped it out for creamy white beans. 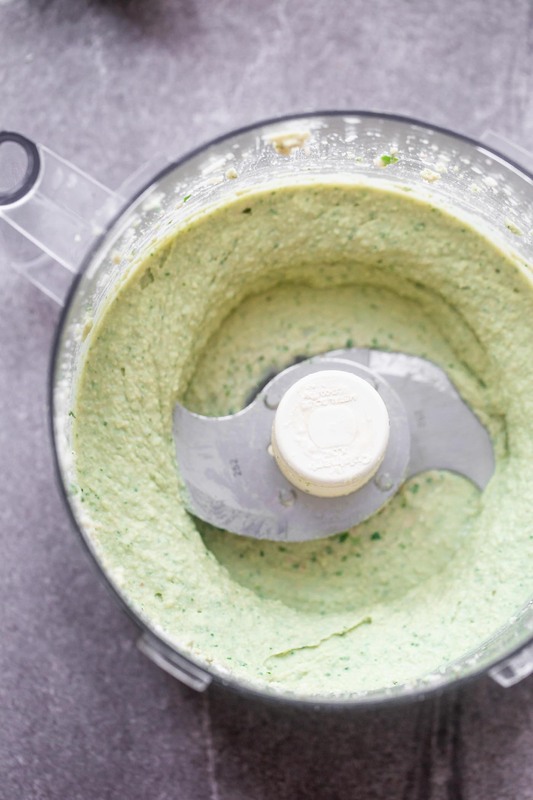 Tahini, garlic, olive oil, and plenty of lemon juice remain from the hummus side, while tons of fresh basil, pine nuts, and parmesan cheese remain from the pesto side. 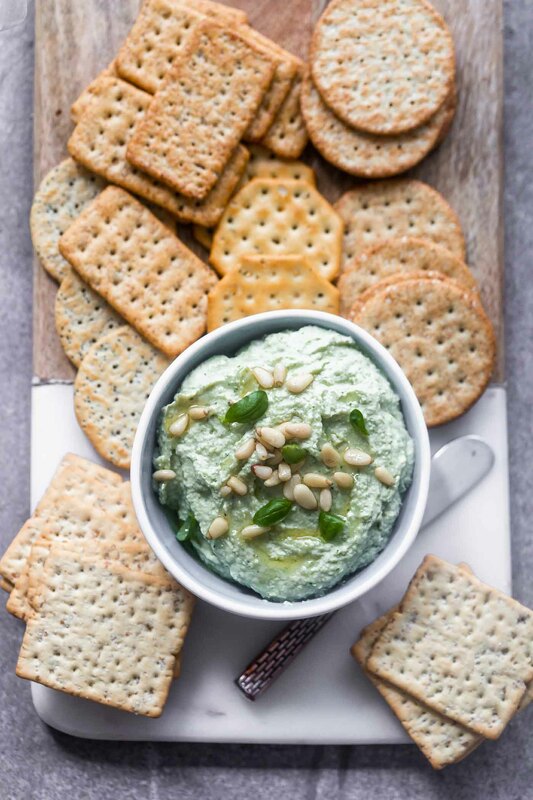 What I kind of love about it, is it doesn’t scream PESTO or HUMMUS when you take your first bite, it’s just a darn good dip that keeps you coming back for more. It’s only on bite two, three or four when questions start to materialize. Is this pesto? Is this hummus? Is this white bean dip?? And the answer is: who cares?! Just keep dipping, and enjoy. 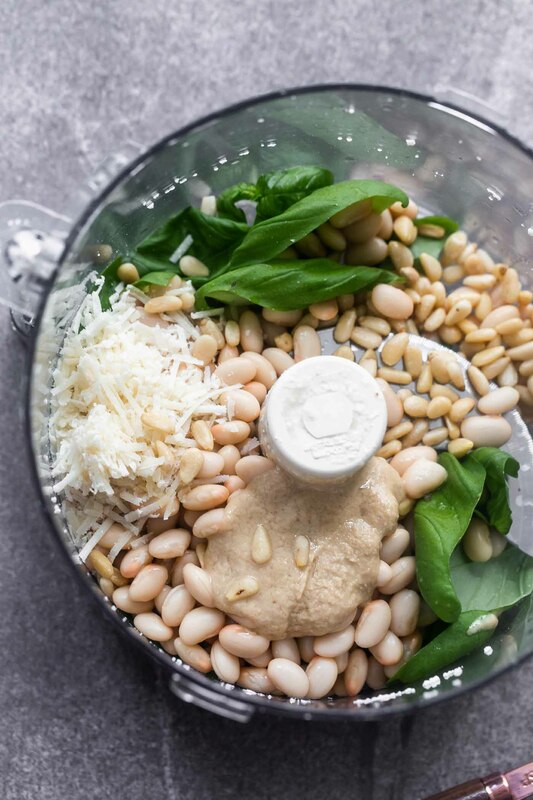 Add basil, garlic, parmesan, pine nuts, lemon juice, tahini, white beans and salt to a food processor. Blend until smooth. While the mixer is on, drizzle in olive oil. Blend until completely smooth. Season with salt and pepper. Serve with crackers and crudités. One Response to "Pesto White Bean Hummus"
That sounds delicious, and a great new way to make hummus!